Here’s this week’s Media Mix about summertime energy needs. 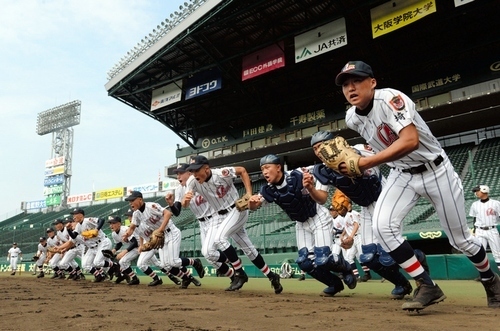 As mentioned near the beginning, the summer National High School Baseball Tournament is one long expression of gaman (patience) since it takes place during the hottest time of the year. There’s also a high school baseball tournament in the spring, which I’ve never quite understood–why two?–but in any case the summer contest is much more popular. However, my partner recently read somewhere that the tournament isn’t quite as gaman as it makes itself out to be. Apparently, the dugouts are air conditioned, thus providing some relief to players when they aren’t on the field. She happens to have a friend who works at the tournament on a contract basis and she asked her if this is true. The friend was quite shocked and assumed it was just a rumor devised to denigrate the tournament, but she agreed to ask around and, apparently, it is true, though the organizers and sponsors want to keep it a secret since it would spoil some of the drama that’s so integral to the spectators’ appreciation of the games. This entry was posted in Media and tagged heat wave. Bookmark the permalink.